Image Size: 16.75" x 25.25"
Overall Size: 23.25" x 31.25"
No scene is more compelling to an appreciation of the price of freedom than one capturing the emotional departure of a service member from their families. Though almost routine for members of America's active duty military, it becomes quite challenging for our citizen soldiers. Beginning with the first settlers, it was critical to their survival that every man was prepared to pick up a weapon and join with their neighbors to defend their homes. This requirement continues today as the active component has been downsized, placing greater responsibility on the shoulders of our National Guard and Reserve forces. Then came the events of September 11, 2001. Within minutes of the tragic events of that day, the National Guard had units mobilized to assist in New York City, the Pentagon, and western Pennsylvania. Shortly thereafter, a full-scale mobilization occurred as National Guard and Reserve units responded to protect the American homeland in Operation Noble Eagle. This duty included security at all commercial airports, guarding nuclear power plants and water facilities, and numerous other civilian and military installations. Then came the call to Enduring Freedom, and most recently Iraqi Freedom. In the final analysis, all Americans must understand that "Freedom isn't Free." To preserve those liberties that we enjoy require a tremendous sacrifice on the part of our entire military, including our National Guard and Reserve forces. 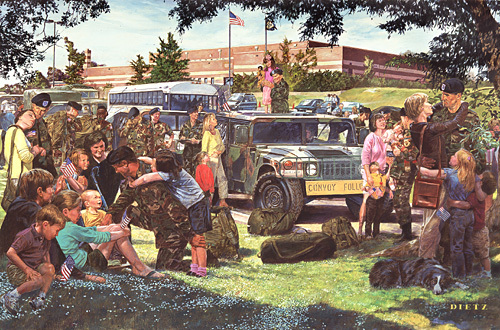 In this limited edition print, renowned artist Jim Dietz has captured a typical scene where our citizen soldiers are about to answer duty's call. Leaving their jobs, their homes, and their families, they continue to respond in the finest traditions established throughout our history. This print captures their sacrifice and the sacrifice of their families to insure the liberty and security enjoyed by all Americans. "Freedom isn't Free!" Whenever the country calls, America's National Guard and Reserves are there, Americans at their best. Whether serving their community in time of natural disaster, working in a state emergency, or serving in a federal status as part of the active component, the Guard and Reserve is there.